The band split in 2004 after releasing two albums, with co-frontmen Doherty and Carl Barat going on to pursue their own careers amid sporadic reunions. Doherty released solo material but became better known for his drug problems, brushes with the law and relationship with Kate Moss than his music, while Barat fronted the band Dirty Pretty Things. 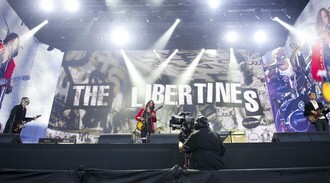 The Libertines scored top 40 hits with singles Time For Heroes and Don’t Look Back Into The Sun, and their biggest hit, Can’t Stand Me Now, which echoed the difficulties between once-loyal friends Barat and Doherty, reached number two. Their second, self-titled album topped the charts in 2004.